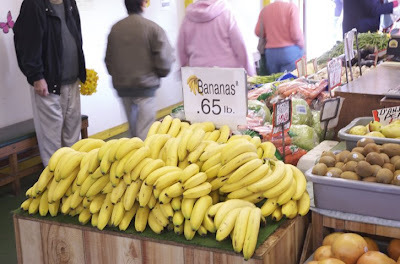 The “Blog” of “Unnecessary” Quotation Marks: "bananas"
heh heh. "bananas." lets get some with NUTS. Thanks Tim, who saw this in South Bend. "We prefer to call them plantains, but if you insist..."
They look pretty bananesque to me! Why should they insist they may not be bananas? Yes, we have no bananas! "Bananas," sure, but no bananas.